Natural history collections in museums and institutions across the world have long been the basis of scientific interrogation as well as artistic inspiration. For this reason, we were very interested to meet ALA user Peter Forward, a visual artist from Victoria. Peter is a sculptor with an interest in Australian species loss. 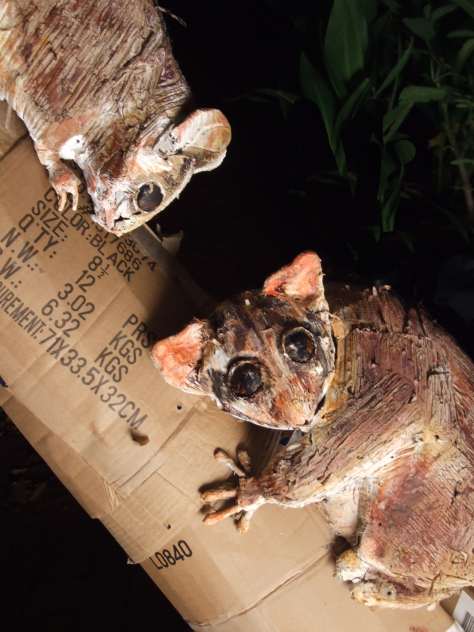 He was awarded the 2014 Toyota Sculpture Prize in Melbourne for his sculptural work Departure Lounge which documents a selection of Australian mammals on the path to extinction, using recycled cardboard. Recently, Peter used the ALA to obtain current and historical records of local species in the Goulburn River, Broken Creek and Barmah Forest areas to inform an artist-in-residence project at The G.R.A.I.N. Store in Nathalia, Northern Victoria. This 2-week project aimed to increase public awareness of species and habitat decline in that area. “My project crosses the boundaries of both natural science and art by representing species accurately but also referencing the inherent threat human ‘requirements’ pose to their continued existence,” Peter said. Peter also submits his own sightings to the ALA. If he is unsure of the identity of the sightings, he first posts them on BowerBird. When the sighting has been recognised and identified in Bowerbird, it is automatically added to the ALA.
We are pleased to know that the Atlas of Living Australia is proving to be a useful resource for artists as well as scientists. Please contact us to let us know how you use the Atlas of Living Australia. The award-winning exhibition Departure Lounge will be opened at The G.R.A.I.N. Store in Nathalia on Sunday June 19th, 2016 at 4pm by John Kean curator, writer and Honorary Associate of Museum Victoria. Peter Forward’s sculpture of a Leadbeater’s Possum formed part of the Departure Lounge exhibit. Image: Peter Forward.